I will nev­er get over it, and that’s all there is to it. So I have about five Kurt sto­ries. Maybe six. Here are two of them. Tim May died last month. We hadn’t spo­ken in at least a life­time, but he was a dai­ly voice on my screen at a cer­tain time back in the 90s, in the day when the cypher­punks list was not only required read­ing but a required place to be — a time when at least a few of us at Wired held seri­ous to the idea of Mar­shall McLuhan as the magazine’s “patron saint.” Those were the days when the net came to me through the full-screen pine mail­er inside a Lin­ux shell, at the speed of an ISDN line — one that was nor­mal­ly reserved for busi­ness­es, but that I’d talked AT&T into installing in my home. I might’ve emailed him only once or twice in the years since 9/11, but I often won­dered what he thought of this new age, with the accel­er­a­tion of the net and its par­al­lel degen­er­a­tion of civil­i­ty, soci­ety, cul­ture. He fig­ured all of this long ago and didn’t want any part of it. He was so pri­vate you still can’t see his house on Google. There isn’t an image any­where. You can’t even see his street — just the base of it at the bot­tom of a hill, well before it curves off to where his dri­ve­way even­tu­al­ly begins. Our only col­lab­o­ra­tion was a cypher­punks-era microzine, “tim­may,” that I cod­ed in plain TeX, com­pil­ing some of the most out­landish and grotesque anti-May insults that were inter­ject­ed anony­mous­ly into our cypher­punks con­vos. Back then, if you were writ­ing any­thing new and out­side the main­stream, you did it in a zine. I think copies might’ve been giv­en out at a con — and, of course, mail order. That’s how things got out in those days. And “tim­may” was per­fect­ly out­ré, so he appre­ci­at­ed it. There’s prob­a­bly only a dozen copies in exis­tence, although I still have the files. It’s just a hand­ful of small pages, a microzine, and none of the facts in it are real — but fic­tion is like that. No writ­ers — as in mak­ers of sto­ries, fic­tion, nar­ra­tive prose — hung out in these places or under­stood it or were part of it, but the net was my mate­r­i­al. The world was chang­ing and the new online world was as real as any­thing. The thought was that “tim­may” would be a weird lit­tle post-post­mod­ern art pan­e­gyric to his ideas of lib­er­ty and free speech. As it turns out, it was quick­ly for­got­ten — tucked away in time with all my oth­er post-col­lege junk. Every­thing moved on. Until now. And look­ing at it, right after read­ing his obit, I see that it became exact­ly what I thought it would, almost as if I’d felt this moment com­ing twen­ty years before: it’s just a set of cold, old sym­bols on the page, with all the remote and final feel­ing of a eulo­gy. New poem, “A Poem’s Truth,” was pub­lished today by The Soci­ety of Clas­si­cal Poets. New in SPAM Zine #8, “long­stand­ing poten­tial-nov­el plothaunt idea.” Release par­ty at The Poet­ry Club, Glas­gow, Sep­tem­ber 13. William S. Bur­roughs used to say (via Brion Gysin) that writ­ing was fifty years behind paint­ing. A half cen­tu­ry ago, Pop Art framed the visu­al media envi­ron­ment. 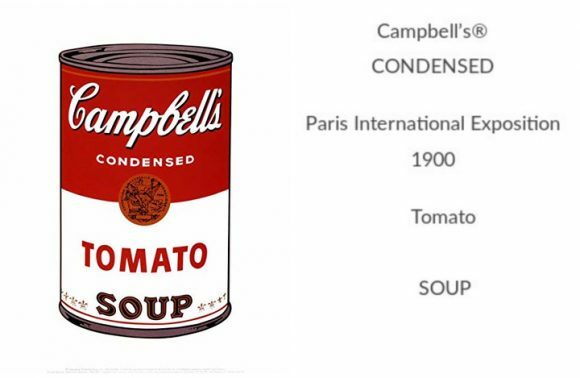 Andy Warhol’s “Campbell’s Soup I” port­fo­lio of silkscreens was print­ed in 1968. Fifty years lat­er, edi­tor John Tre­fry selects an abridged ver­sion of my “Campbell’s Soup I” for Burn­ing House Press.